Smartphones connect various kinds of relationships and prove essential for connection. Checking if your friend replied to your text or seeing who liked your most recent post feels like a daily routine to teenagers. Social media sites (SMS) such as Twitter, Instagram, and Snapchat show every detail of a person’s life and allows students to show off their social status. More likes and comments on posts means more friends, but not all followers act like friends. Despite the entertainment these sites provide, they create a haven for bullying and harassment. 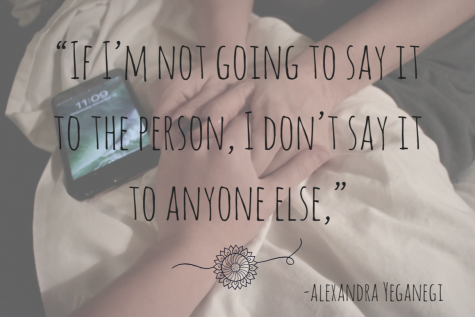 “I think cyberbullying changes a lot of people’s actions and how they act around other people. They will be scared to act a certain way or post something because of the way people will react to it,” senior Malik Balogun said. Cyberbullying, the type of bullying on a digital platform, happens constantly with or without the knowledge of others. Cyberbullying most commonly occurs on programs like social media sites and texting programs. Although parents and educators address cyberbullying concerns, the message does not seem to affect students. Kids constantly receive harassment about their appearance, personality, smarts, and other personal qualities. In certain cases, students casually scroll through harmful comments with no intent on stopping it or reaching out. 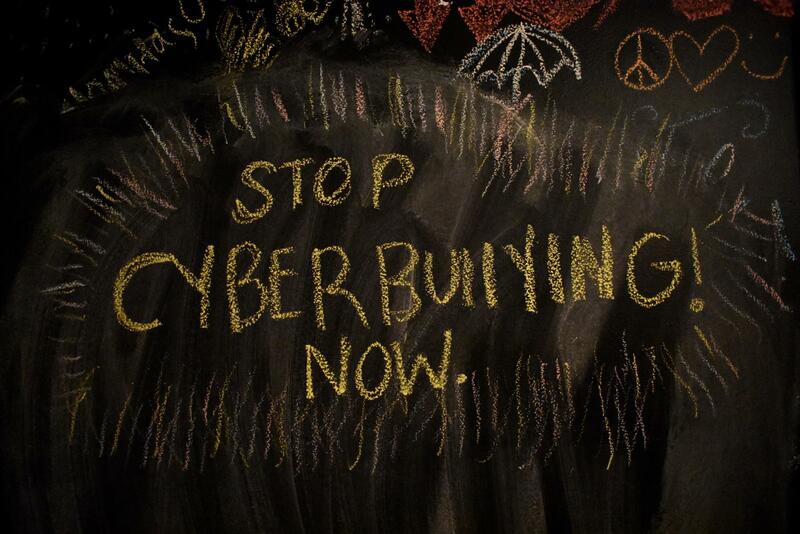 As social media usage increases, cyberbullying becomes more difficult to completely eliminate. “If you are making fun of something a person can’t change physically, that is the most intense kind of bullying in my opinion,” Balogun said. With ample access to the powerful internet, students can communicate and post constantly. The incessant need for students to log onto social sites does not allow students to rest. Persistence, the key to an online bully, overwhelms students and causes unneeded stress. After falling asleep at night, a student can easily wake up to multiple notifications on their phones. The internet, despite its helpful qualities, also comes with repercussions. Most information on the internet permanently stays on the internet and, unless reported or personally deleted, removal will not happen. On top of the bullying, the constant ability to look back on hurtful comments traumatises students. Although most social media sites allow for the reporting of harmful comments, this long process loses effect over time. Hard to notice and pick up on, cyber bullying needs special attention to prevent. With limited access to social media accounts, adults and educators can not oversee all that happens. Surveys show that 52% of students reported that they experienced cyberbullying themselves, and only 6% of parents know of the intensity and impact of the subject. Less awareness in adults allows for more chances of it happening. “I think a lot of it is teaching kids how to use social media responsibly and teaching them how to protect themselves so that cyberbullies can’t reach them,” American literature teacher Alexandra Yeganegi said. On different occasions, in cases seen on social media sites, happens in groups. A Twitter trend, subtweeting (subliminal tweeting), allows for students to gossip and talk about others without their knowledge. The impact of subtweeting affects teenagers emotions, and once it starts, a fire ignites. “I think gossiping in a large group polarizes people’s thoughts. Like if you’re in a big group of people and you all hate the same person, then the hate grows stronger, and could influence retaliations, so gossiping in large groups could cause more bullying down the line,” Balogun said. Reporting systems on sites such as Instagram and Snapchat lend help in cyberbullying cases. By reporting harmful comments or blocking bullies, this begins the road to improvement online, but more times than not people feel too scared to report cyberbullying for the fear of punishment from other students. Realizing you do not have fault, helps students deflect the harassment, and a key element to removing the hate from your Instagram feed. Most kids who become bullies come from broken homes and feelings of neglect. It can also show that they also have experienced bullying themselves. “I think that a lot of the time people don’t have the coping mechanisms to realize that people who bully do it because of themselves, and it’s not the fault of the person being bullied,” Yeganegi said. More difficult to tackle, cyberbullying occurring in groups creates for harmful atmospheres for students. Gossip, an unavoidable trend, occurs especially in high school, but where does innocent gossip turn into harmful bullying? Screenshotting pictures and sharing them with others shames students and encourages others to become involved. 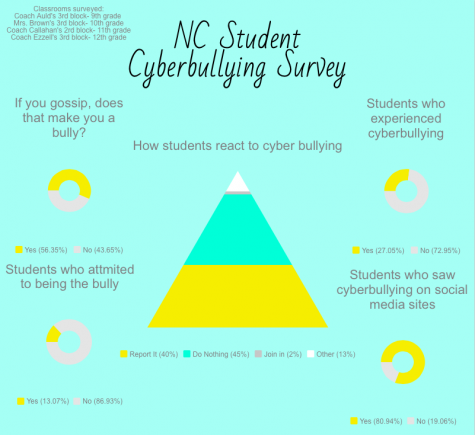 In a survey conducted at NC, students from all grade levels answered multiple questions about their experiences with cyberbullying. Out of 100 students, 62 said that gossiping make a person a bully. Cyberbullying affects students emotionally and physically. In certain cases, kids who experience cyberbullying most likely begin using drugs and alcohol. Students begin to unwillingly attend school and may end up skipping all together. Low self-esteem roots from cyberbullying, as well as suicidal thoughts and actions. Long-lasting effects in cyberbullying continue on, and the need to communicate this problem with educators and adults grows every day. Preventing cyberbullying proves a difficult task and takes the participation of all students and parents involved. Studies show that better outcomes come from parents who stress the consequences of cyberbullying and set specific rules regarding behavior online and on social media accounts. Encouraging students to report instances of cyberbullying shows more improvement in activity online. Although the harmful comments and posts need to decrease, keeping the proof allows for adults to see what actually happened. 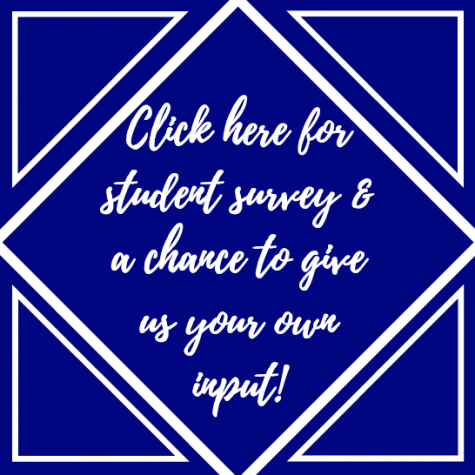 In the same survey conducted at NC, out of 100 students, 67 said that they saw harassment occurring on social media sites such as Twitter, Instagram, Facebook, and Snapchat. With 67 students saying they saw this happen, 53 said that when they see it they simply do nothing about it. Only 36 students said they report the bullying. If students and adults become more aware of the dangers and effects of cyberbullying, less problems will result from social media usage. Reporting concerns can help those who struggle with harassment on the internet. High school, an already difficult time in adolescence, needs students and educators to team up to report and prevent cyberbullying to make for a healthier social media atmosphere.